In this age of lunchtime lifts, wrinkle-erasing injections, furrow fillers, and lip plumpers, there's no question that anyone who aims to look younger easily can. But Lauren Kessler wants something more than to follow the cosmetic path to youthfulness. She wants to live with energy, stamina, vitality, resilience, and health for a very, very long time. Her goal: to reverse her biological age from the inside out. Guided by both intense curiosity and healthy skepticism, a sense of adventure and a sense of humor, Kessler sets out to discover just what's required to prolong those healthy, vital, and productive years called the "health span." In her yearlong journey, Kessler investigates and fully immerses herself in the hope and hype of the anti-aging movement. She delves into the new science of "biomarkers"—objective, measurable indications of how old you really are on the inside—going as far as getting a muscle biopsy to determine the state of her mitochondria, the parts of cells that control metabolism. She tries Tabata training, calorie restriction, a diet centered on 20 superfoods, hCG (human chorionic gonadotropin), hypnosis to achieve a youthful mindset, and much more. In a voice that speaks to every woman who feels her date of birth and sense of self have little in common, Kessler explores her own fears, attitudes, and assumptions about aging. 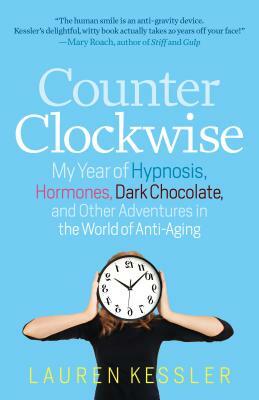 Counterclockwise is a thoughtful, hilarious, and informative tale of what's really possible when you get serious about taking charge of how well and how quickly you age. Lauren Kessler is the author of My Teenage Werewolf: A Mother, a Daughter, a Journey Through the Thicket of Adolescence; award-winning Dancing with Rose; Washington Post bestseller Clever Girl; and Los Angeles Times bestseller The Happy Bottom Riding Club. Her journalism has appeared in the New York Times Magazine; Los Angeles Times Magazine; O, the Oprah Magazine; Ladies' Home Journal; Woman's Day; Prevention; and Salon. A national speaker and workshop leader, she directs the graduate program in multimedia narrative journalism at the University of Oregon. She lives in Eugene, Oregon, with her writer husband, Tom Hager, her teenage (werewolf) daughter, four carefree chickens, and a cat that thinks it's a dog.